Following the "Schism", the Old Believers soon divided into two separate groups of faithful: the "priested" Old Believers have struggled to retain Apostolic succession and the sacramental life (by obtaining their hierarchy via the Ecumenical Patriarchate), while the "priestless" Old Believers feel that the possibility of an on-going Apostolic succession was impossible, since no bishops had openly broken ranks with Patriarch Nikon and separated themselves from the Moscow Patriarchate in defense of the Old Rituals. (The priestless Old Believers continue to maintain a nearly full cycle of services, but without the Divine Liturgy and the sacramental life.) The two groups do not generally consider themselves in opposition to each other, but frequently maintain dialogues and share many common cultural and literary resources (especially the republication of pre-Nikonian liturgical books). In reality, they consider themselves to be in opposition to the "State Church" and the modern secular and atheistic culture. Before discussing the particular features of liturgical singing in the Old Rite traditions, we first need to be aware of the fundamental principles in the external modes of worship according to Russia's medieval spiritual culture. The most fundamental principle of Old Rite worship is the strict observance of the Typicon as the ideal method of helping Orthodox Christians achieve salvation, particularly by means of the ascetic struggles and inner discipline required to accomplish this lofty goal. As a rule, a complete cycle of services must be performed for any given day that the Divine Liturgy will be served, and the concluding Vespers and Compline must likewise be served. Anyone who wishes to receive Communion must attend the full cycle of services offered as part of his/her preparation. Furthermore, it is completely unacceptable to abbreviate the services, and everything should be be done strictly according to the Typicon (по уставу, "po ustavu"). The Old Believers follow the Sabbaitic (Jerusalem) Typicon according to the pre-Nikonian printed rescension, which is based on a manuscript tradition not clearly identified by historians. However, some trace elements of the earlier Studite Typicon continue to survive to this day. (As an example: many Old Rite parishes choose to not serve the All-Night Vigil on Saturday evenings, but serve Vespers in the evening and Matins, the Hours and Liturgy in the morning.) As one can see from the photo, the Typicon (which is called "Око церковное", "The Eye of the Church") is a extremely large volume; it contains almost all of the instructions for conducting worship services for every day of the year and for every possible coinciding of feasts. Together with the observance of a full cycle of services for laity in parishes comes the ideological concept that there is barely any difference between monastic life and the lives of laity. If we as Orthodox Christians are indeed already called to lead lives apart from the world while living in the world, then the idolizing of monasticism as superior to the lay life is revealed as a flawed manner of thinking. As part of Old Believer philosophy, we feel that living the Christian life in all its fullness is what we are called to do, no matter our calling or station in life; some people choose to live the monastic life because they find it too difficult to fully dedicate their lives to God in the mainstream world, and thus they seek the seclusion of monastic life to eliminate the temptations and distractions of life in the world in order to work out their salvation. The "Oko tserkovnoe" ("The Eye of the Church"), the pre-Nikonian Russian version of the Sabbaitic or Jerusalem Typicon (Moscow 1610 edition). As part of this Christian ideology, we are called to develop personal and communal discipline. Personal discipline includes: accepting the gender roles we were born into and the responsibilities that come with this; maintaining a daily prayer rule; maintaining good order (порядок, благочиние) and discipline in one's daily life; keeping the fasts; giving alms and supporting one's church; etc. Communal discipline includes: achieving unity with God through unity of a shared faith (соборность, "sobornost"); frequent participation in parish life; maintaining good order and discipline in the services; performing the prayers and rituals all together at the appointed times and places, instead of whenever we feel inspired to do them (particularly when making the Sign of the Cross and bows); maintaining unison singing and the memorization of common texts; wearing special clothing to adhere to an iconic principle (chanters and readers wear a kaftan or azyam, men do not cut or trim their beards, and women wear head coverings over uncut hair); standing in orderly rows with arms folded (following the ancient monastic model of keeping the hands confined to avoid fidgeting); use of a prayer cloth (подручник, "podruchnik") when making prostrations, and use of a leather prayer rope (лестовка, "lestovka") to count prayers and bows; and observing special Entrance and Departure Prayers (both for the home and for church services). The Church of the Transfiguration on the Island of Kizhi in Lake Onega (northern Russia) is an outstanding example of traditional wooden architecture which allows the services to be conducted accurately according to the pre-Nikonian Sabbaitic Typicon. Communities of Russian Old Ritualists have preserved a number of oral traditions which have become almost completely forgotten in the contemporary Russian Orthodox Church. The fact that all groups of Old Believers from all over Russia (and beyond its borders) share such customs, despite their religious differences and lack of cultural contact between such groups, is fairly convincing testimony that such traditions did not evolve as a result of their separation from the dominant Russian Church, but rather are traditions that have survived from long before the schism in the Church. In part due to regional isolation, all groups have preserved oral traditions that exhibit not only a wide variety of vocal techniques and repertoire, but also an amazing degree of consistency. 1) The Russian Church before the schism had firmly rejected the use of harmony and choral singing in ecclesiastical worship. This issue was most notably discussed at the Stoglav Council in Moscow, 1551 during the reign of Tsar Ivan IV (the Terrible). At this council, not only was the tradition of monophonic chanting upheld, supported by excerpts from Canon Law (the "Kormchaia" or "Rudder"), but such a tradition was elevated to national ecclesiastical law. While the modern Russian Church fully embraces part-singing, the Old Ritualists continue to reject it as "uncanonical" (i.e. violating canon law or the principles established by the holy fathers in the canons of the Church Councils). 2) As a rule, Old Ritualists try to maintain two separate choirs to maintain the tradition of antiphonal singing (unless, of course, there are simply not enough chanters to allow this). According to ancient monastic tradition, the right choir is the lead choir on Tuesdays, Thursdays, Saturdays and Sundays, while the left choir leads the services on Mondays, Wednesdays and Fridays. The antiphonal style of singing is almost always performed in connection with a Canonarch (a tonsured liturgical reader), a Psalmist (someone who is appointed to read psalms) or an appointed Reader. In the ancient manner of singing psalms, called "Stichologia", the reader interacts with the choirs alternately: he reads a portion of text and concludes the reading by raising the pitch; the chanters of the right choir repeat the last phrase and sing an appointed refrain; the reader continues with the reading and the left choir repeats the final phrase and refrain. This pattern of alternation continues until the psalm is finished (often concluded by the "Glory...", "Both now...", and "Alleluia, alleluia, glory to Thee, O God" thrice with bows). Stichera are likewise sung by the choirs in turn. 3) While the practice of monophonic (unison) chanting is preserved in church services, there are moments in the church singing where various individuals might have learned a melodic line in a slightly different fashion, and thus moments of dissonance and harmony occur unintentionally. This phenomenon, which is usually associated with folk singing, is technically referred to as "heterophony" and is not true polyphony. — Outside of church worship, the folk music of Old Believers has a greater degree of harmonization, which is sometimes unintentional and sometimes deliberate. This type of harmony, however, is often quite rudimentary and exhibits elements of dissonance and vocal techniques not found in modern European cultures. Efforts at theoretical analysis of scales and modality often prove futile, as there are no strict rules or theory governing this oral tradition. To be more precise, it is better to refer to such harmony as "folk polyphony." Stray remnants of the ancient vocalization of the "hard" and "soft signs" as full vowels (such as the words "serd[e]tsa", "soln[e]tsa" and "zem[e]li"), a practice which is called "khomonie" or "khomovoe penie". In general, singing with a noticable vibrato or sliding from one pitch to another are discouraged, but one can certainly hear examples of these vocal abuses in some communities. The highly cultivated "bel canto" style of singing, common to European classical and operatic vocal music, is not heard among Old Believers, and it rightly has no place in authentic performance of Znamenny Chant. 6) Except in the more melismatic chants of the church rituals (such as the "Alleluia" and Communion Hymns, etc.) and secular folk singing, Old Believers do not rely on metered rhythms. Common elements of the services are almost entirely syllabic and derive their rhythms from the natural stresses of the words. Some of the more complex hymns which are sung from the chant books (such as the stichera) gravitate toward a steady duple (2/4 or 4/4) rhythm similar to walking or swinging one's arm (the "takt", based on the Latin term "tactus"), but are by no means locked into slavishly maintaining this rhythm for the duration of the chant. 7) One of the most puzzling consistencies in Old Ritualist singing is the use of the "raised leading tone", a vocal practice common to most European cultures and first documented during the late medieval to early Renaissance eras (the "musica ficta"). While the European scales are based on an octave, medieval Russian music, however, is based upon four sequences of stacked thirds (or two hexachords) which are complete units. The principle of a raised leading tone can occur on the pitches "do" and "fa" of each half of the full range of 12 pitches (the "gamut"), and occurs primarily in cadential formulas and in some descending patterns. It is interesting to note that there is some similarity to how the raised leading tone occurs in Byzantine Chant, with its "Rule with many exceptions." It is also interesting to note that many communities sing both the Small Znamenny (Samoglasen) melody and various musical patterns (popevki) of the 3rd sticheraric Tone with an augmented interval, similar to Mode 3 anomalies in Byzantine Chant. 9) Traditionally the church singing is started by a single leader, called the "Golovshchik" or "Starter". His responsibility is to select a starting pitch which the others must match. An experienced Starter with good musical pitch can maintain a great deal of consistency in pitches and tonality throughout the course of the service, which produces an orderly and pleasing effect. The members of the cleros (choir) should wait for a moment to hear the starting pitch before joining in. 10) Old Believers do not generally use a method of directing the singers by means of hand movements, such as are used by modern choral conducters. Occasionally a choir leader will move his hand up and down for several beats to correct a tempo which is too fast or slow, or signal for the volume to increase or decrease when the singers need to match the mood of the liturgical actions (such as at the Cherubic Hymn or the Great Doxology). In some regions the choir leader will use an "Ukazka", a very long narrow stick, to point to the neumes being sung, to tap out the rhythm and to indicate the shape of the melody. 11) Old Believers have a variety of opinions and practices regarding who is allowed to sing on the cleros (клирос, "kliros" or крылос, "krylos"). The most traditional groups only allow men to sing on the cleros, but following the 1917 Revolution there have been many circumstances (especially during WWII) where women have had to fulfill this task, and once allowed to sing there is no turning back. 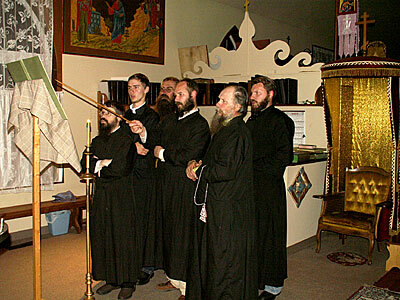 As mentioned previously, men who stand on the cleros wear a "kaftan" (a black garment similar to a cassock, but only buttoned from the neck to the waist, and derived from the old peasant coat that was worn in pre-modern Russia), and they stand with their arms folded (derived from the monastic tradition of standing with arms crossed on one's chest). It is common for devout singers and readers to hold a "Lestovka" (лестовка), which is a leather prayer rope used for counting prayers; it is especially useful in counting the repetitions of "Lord, have mercy." 12) Old Believers maintain the use of a more evolved manner of performing the readings in public worship. While the modern Russian Church has lost this part of its cultural heritage (preferring to use only a single monotone pattern), more elaborate systems of reading continue to flourish among the Old Ritualists. 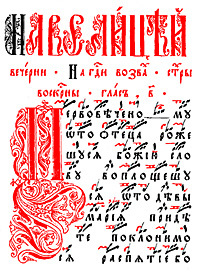 The various types of literature read in the service are each read with their own stylized method of presentation (called погласица, "poglasitsa", melodic reading); such methods of reading may vary considerably from one community to another, but the principle is fairly consistent throughout the entire range of Old Rite communities. 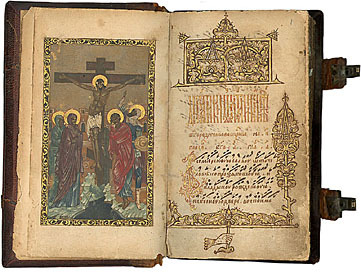 Russian Znamenny chant books from the early 17th and late 18th centuries. C. THE MELODIC GENRES OF "ZNAMENNY CHANT"
i.) Psalm 103 at the beginning of Vespers whenever there is a vigil. ii.) The first stasis of the First Kathisma at Vespers - when the service is Great Doxology rank or higher. iii.) The four Psalms at Vespers, beginning with "Lord, I have cried", whenever they are appointed to be sung. Modern practice is to chant only the first two verses and read the rest, but pre-Nikonian practice is responsorial. We sing the refrains all the way to the end of these Psalms, then back up ten verses and do them again with the appointed stichera. vi.) The Polieleos, which is Psalms 134 (with the refrain "Alleluia") and Psalm 135 (with the refrain "Alleluia, alleluia, for His mercy endureth forever, Alleluia"). On the three Sundays before Great Lent, we also chant the Psalm 136 ("By the rivers of Babylon") in the same manner. vii.) Whenever there is a Velichanie (Magnification) following the Polieleos, we antiphonally chant the Selected Psalms, with the Velichanie sung as the refrain. The Psalmist (Psalomshchik) reads a portion of these psalms, then the choir finishes a verse and sings the Velichanie; this goes on until the end of the selected psalms. viii.) The Praises at Matins, whenever there is a Great Feast (they are read as usual on a typical Sunday). ix.) We also chant the 17th Kathisma whenever we observe a Panykhida. But the melodies we chant are different from those we use for Sunday at Matins. In addition, the Panykhida version of the 17th Kathisma is divided in half, with only 2 melodies, as opposed to the usual 3 stases. x.) The hymns "God is with us" and "O Lord of hosts, be with us" at Great Compline are likewise sung in this manner. xi.) The Biblical Odes during the weekdays of Great Lent are likewise sung in this genre. i.) the Refrains between the Stichera. These brief musical phrases help to separate and introduce the appointed stichera. It is customary for the reader or canonarch to announce the Tone (and Podoben), especially when the Tone changes from the previous hymn. ii.) Idiomela Stichera (Great Znamenny Chant). These are the stichera in the chant books which have musical notation, with fairly complex melodies in the Great Znamenny Chant. These "idiomela" (unique melodies), which are found in most of the chant books, are designed for specific liturgical texts and will not be shared with other hymns. (Although technically "Idiomelon" translates into Slavonic as "Samoglasen", the Russians have misunderstood the fundamental concept and have mistakenly transferred this term to the Small Znamenny Chant melodies. It is common to call the full idiomela stichera melodies "Great Chant" to distinguish them from the "Small Chant".) The Great Znamenny Chant stichera are noted for their complexity and frequent use of multi-syllabic and melismatic passages (frequently highlighting significant theological points), as well as phrase ornamentations and a stately relaxed tempo. iv.) Automela/Samopodobny and Prosomia/Podobny melodies. In the Byzantine Chant tradition, for all those occasions where the hymns are not notated in chant books with musical notation (non-feast days and lesser feasts), the Greeks have a highly-evolved system of borrowing melodies from well-known hymns which are notated in the chant books. (For Russians, this tradition of borrowing melodies is less common, and instead they rely heavily on the Small Znamenny Chant system.) The Automela/Samopodobny are the "model melodies" which are well-known hymns from important feasts. The Prosomia/Podobny are hymns which are sung according to these model melodies. Thus, it is common to sing the hymns for a lesser-known saint according to the melodies of hymns for a well-known saint; it is no coincidence that the hymns of the lesser services were composed following the models and themes of greater and earlier historical occasions. During the great flourishing of the singing schools in Novgorod, Pskov and Moscow during the 16th century, several hymns from the Ordinary (Obikhod), used for the vigil service and for great feasts, were set to melodies in the sticheraric genre (such as "O gentle light..." in Tone 6). The sticheraric melodies are not generally used in the Divine Liturgy, except for the singing of the troparia at the Beatutudes, and (in some communities) for the Troparia and Kontakia of Great Feasts. This includes all the heirmoi of the canons, as well as the refrains for the 9th Ode of various festal canons. (In the eastern Slavic chant books, the heirmoi are arranged according to the 8 Tones, and not by the feasts, as the contemporary Byzantine Chant books are.) 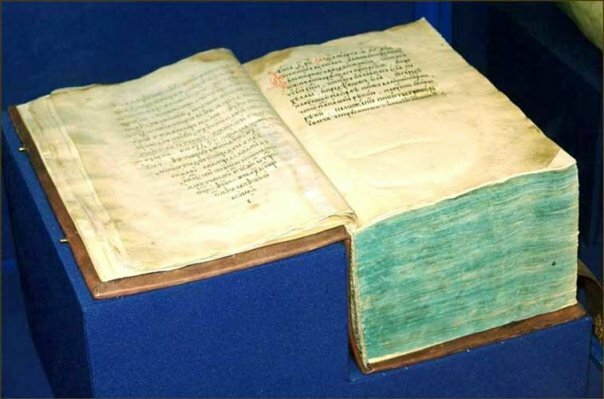 Some chant books have lengthy settings of the 9th Ode of canons for the Great Feasts (the "Zadostoiniki", which are sung at the Divine Liturgy) in Great Znamenny and Put' Chants; however, these medieval compositions are based on the sticheraric genre. The Hiermological hymns are simpler than hymns of sticheraric composition. Like their Byzantine counterparts, they generally tend to have less complex (monosyllabic) melodies, and are sparing in melismatic passages and ornamentation. The hiermoi are sung with a more lively tempo than stichera, and one could easily describe the melodies as pleasant and "singable". various other short phrases that use this genre of melodies. Most church musicologists agree that singing Troparia to Stichera melodies (even the Small Znamenny Chant melodies) is technically an inauthentic practice of mixing musical genres, and thus should be avoided. (This abuse is usually the result of ignorance on the part of choir leaders.) There are certain exceptions for using the Small Chant Stichera melodies, however, which are deemed more acceptable, such as the Troparia (from the Canon at Matins) sung at the Beatitudes. On feasts it is traditional in some Old Believer communities to sing the Troparia at the end of Vespers, at Matins on "God is the Lord" and after the Great Doxology, and at the Divine Liturgy according to the Small Chant melodies for Stichera; other parishes, however, follow a more authentic practice of singing these festal Troparia according to the Great Chant melodies (if the choir is well trained and the congregation does not mind the extra time involved) or according to the proper Canonarchal melodies (if they lack the training to sing the Great Chant melodies). These are long ornate melodies intended to accompany liturgical action, composed primarily outside the 8-Tone system. This genre includes the Alleluia sung before the Gospel, the Cherubic Hymn and the Communion Hymns, all chanted during the divine Liturgy. Also included are the corresponding hymns in the Presanctified Liturgy, a few settings of the sticheron used for the procession at Pascha (just before Matins), the Trisagion used for funeral processions and during Holy Week, and a variety of non-standard alternate musical settings scattered throughout chant manuscripts. There is no manuscript evidence that these melodies are derived from Byzantine originals, but certainly the liturgical tradition provides evidence of liturgical continuity with the Byzantine tradition. In addition to some of the Common Chants, this genre includes all the rest of the music for the Divine Liturgy (such as the Anaphora), a few selections from the Vigil and from Lenten Vespers and Great Compline, the entire body of Put' Chant melodies (used for Magnifications and various solemn liturgical moments during the vigil), and the entire body of Demestvenny Chant (used for heirarchical liturgies and other festal occasions). Like Common Chant melodies, these hymns do not fit into the 8-Tone system. None of the hymn melodies of this genre seem to be directly derived from Byzantine Chant, and the Put' and Demestvenny repertoires each have their own unique neumatic notations (which are known by only a relatively small percentage of Old Believers and musicologists today). the ornate style of reciting litanies and liturgical dialogue. Originally I had planned on entitling this presentation: "The Loss of Traditional Liturgical Features in the Contemporary Russian New Rite: the Canonarch, the Ambon, Stichologia, Antiphonal Singing, Liturgical Movement and Liturgical Homilies." I had planned on discussing how and why these features were abandoned, the impact that the introduction of polyphonic choral singing had upon this significant shift in liturgics, detailed descriptions of each of the elements, and the possible recovery and reconstruction of some of these "lost" traditions. However, this subject seemed far too broad for a brief presentation, and thus I chose to discuss a more concise topic. Those who wish to learn more about my original topic (and many other subjects) may read more articles at my Web site: http://synaxis.info/psalom/research/simmons/simmons.html. Of course, we know that it is necessary to turn to the Old Ritualist communities for living and thriving examples of many of these "lost" traditions, but throughout most of the three and a half centuries following the tragic schism, there has been a great reluctance on the part of liturgists and musicologists of the dominant "State Church" to spend serious time and energy conducting research among our communities. However, since the fall of communism and the subsequent thawing of relations between the Old and New Rite churches, many people seeking Russia's authenic liturgical traditions have found themselves turning to the Old Ritualists for answers to basic questions regarding the traditions and origins of modern western-style polyphonic singing, the brevity of services, laxity of spiritual discipline, and an overall spiritual focus that no longer even looks or feels "Eastern" or maintains firm roots in Christian antiquity. It is my sincere hope and desire to be part of this rapprochement, and I hope that I have played some role in this by presenting this paper discussing the Rituals and Singing of the Russian Old Believers. I would like to thank the members of the International Society of Orthodox Church Musicians, the faculty of the Theological Seminary of the University of Joensuu, and all the benefactors who have made this music conference possible and who have generously funded many of the expences for those of us traveling from great distances. May God bless all our efforts.